The Simple, Safe, and Secure Way To Manage Healthcare Compliance. We provide innovative technology solutions to help you control, manage and monitor your: medical gas system, the environment in your treatment areas and the efficiency of your OR’s. Our approach helps you maintain the health of your employees in treatment areas with environmental monitoring that measures and documents air exchanges, concentrations of anesthesia gases and long term exposure to many lab and sterilizing chemicals. Our certified staff can come to your facility and make a detailed inspection that will help you pass Joint Commission and CMS. When irregularities or deficiencies are identified CHT can close the loop providing ASSE certified technicians to replace and repair outlets, pumps, lines and alarms. Interested in a Career With CHT? See Your Entire Medical Gas System Documentation. Instantly. 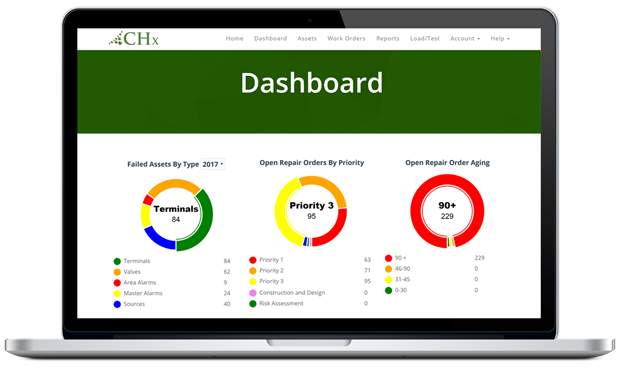 Our state of the art program CHx allows you, your technicians and all the approval agencies to view your entire MedGas system, trace every line and component, view each component’s inspection and test history even the manuals that go along with that component. Imagine a staff member responding to an alarm and being able to map the supply back to its source, check the gauge, the zone valve and the manual to fix it, right on their tablet computer at the component site. CHT has inspected and documented over 500,000 MedGas components around the country, making it easier for those hospitals to manage their compliance, maintenance, and operations. Jason Di Marco and his colleagues found the problem quickly, and replaced and brought the underground pipe line up to compliance with codes, under severe cold conditions, working practically around the clock, to restore oxygen to our facilities. When your staff came to do the room by room testing they were polite and unobtrusive and did the job in a timely manner. They took the time to explain to me what the testing showed and offered advice on how to rectify the problems. Jason DiMarco and his staff were personable, displayed initiative, demonstrated technical expertise and offered a tracking program that exceeded our expectations.